It is a new world out there for book authors and readers. This was the message from Jake Needham to the Pattaya City Expats Club at their August 12 meeting. Jake is the bestselling author of four well known international crime novels with Asian settings that many expats are familiar with: The Big Mango, Laundry Man, Killing Plato, and The Ambassador’s Wife. His fifth book was recently published and is just becoming available in Thailand, A World of Trouble. After Desmond Bishop introduced Jake, he began by noting that unlike the previous times he had spoken to the Club, instead of talking about his books, his topic would be, ‘So You Want to Publish a Book.’ Jake explained how the print publishing business operated and how the publisher and the book store were the gatekeepers between the author and the reader and the control over what was published and distributed was theirs, not the authors or the readers. 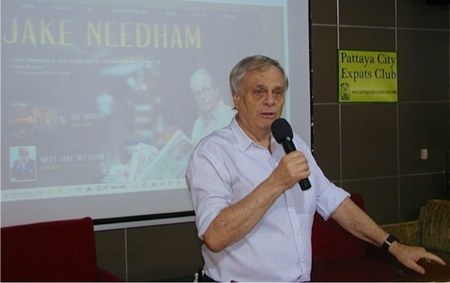 Fellow author Desmond Bishop introduces renowned writer Jake Needham to the August 12th meeting of Pattaya City Expats Club. However, the advent of eBooks is changing the world of publishing. Jake then mentioned several reasons about why eBooks are becoming so popular. You can carry around a library without being weighed down. If you want a book, you don’t have to be concerned if the bookstore has it in stock. If you read a particular author and you want to read more of their work, it can easily be found and downloaded to your device in a matter of minutes, ready to read. It also usually costs much less than the print version, especially the hard cover. If you have an iPad and iPhone, they synchronize with each other so that when you leave off reading on one, you can pick up where you left off on the other. Jake’s talk this time was not about a new book; rather, how the playing field for authors has completely changed with the evolution of the internet, and of self publishing. In a talk that was extremely well received by PCEC members and guests, Jake covered not only ‘why’ to self publish, and also some of the ‘how to’. Jake then described how easy and inexpensive it is to publish an eBook. First, you should have an editor – the cost will depend on the extent of editing you want (proof read for typos and/or grammatical errors, or suggest changes). The next is to have a professional convert your manuscript into digital format and the third is to have a professional design the book cover. Jake noted that the cover is the “ballgame” as it is the cover that sells the book. He mentioned that some thought should go into the cover design because what may be fine for a print copy in a book store may not be suitable for an eBook cover displayed as a “thumbnail” on the Internet. You want something that will catch the reader’s eye. The best is to make it clean and simple. He suggested that you go to Amazon or other eBook websites and scan through the various covers to see what works and what doesn’t. Once you have taken these steps, the rest is easy. Amazon has Kindle Direct Publishing (KDP) that walks you through the process and Barnes & Noble have something similar. You can also use the services of www. smashwords.com, which distributes your eBook to others including Amazon and Barnes & Noble – they do not charge for this service, but will retain a portion of the price for each book sold. Jake said he would not use them for Amazon and Barnes & Noble because it such an easy process, you can do it yourself. Using professionals for editing, formatting, and cover design, will probably not cost more than US$500. He also mentioned that the author generally sets the price they want for their book and can receive up to 70 percent of that amount. Whereas, print book publishers set the original book price and pay 10 percent of that amount to the author for each copy sold. He said that amount is fixed and will continue to be paid even if the publisher later discounts the price. ‘Hawaii Bob’ Sutterfield announces the draw for the Frugal Freddies gift vouchers for the week, at some of Pattaya’s great value for money restaurants. MC Richard Silverberg looks on. He also noted the time differential to collect your royalty from a print publisher, which can be up to a year or longer after the sale, versus a couple of months from the eBook publisher. Further, marketing is much the same as for a print book – word of mouth. But, with all the social networking venues, it is possible to reach many readers in less time. In conclusion, Jake said it is a new world for writers and readers. It is also one for agents and print publishers, but not one they are likely to want. 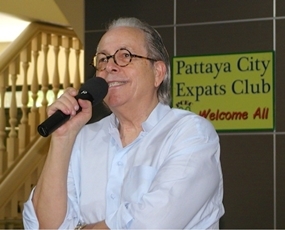 After Jake answered several questions, MC Richard Silverberg updated everyone on upcoming events and called on Roy Albiston to conduct the always interesting and lively Open Forum where questions are asked and answered about expat living in Thailand; Pattaya in particular. 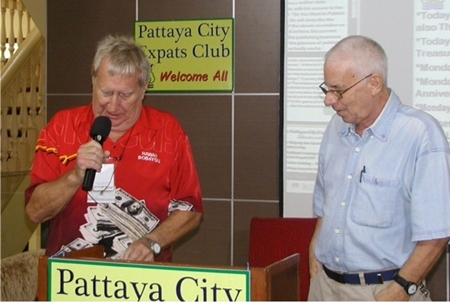 Read more about the Club’s activities on their website at www.pattayacityexpatsclub.com.